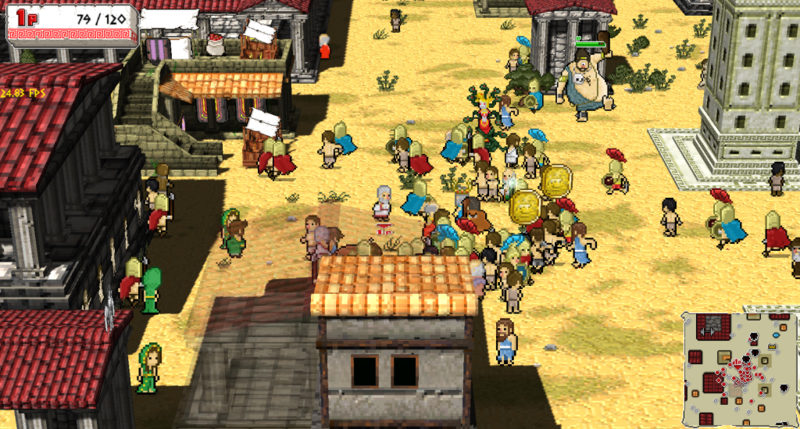 As for the past weeks, we’ve been exploring different alternatives for Okhlos’ core gameplay. We had started to feel that the game was not fun enough, that our core gameplay was not strong enough support a whole game. So we tried to fit the game into to a single genre, to make the design decisions easier and rely on that genre’s core mechanic. We parted from the concept of an Angry Mob. What can we do with it? What would and angry mob rhythm game be like? 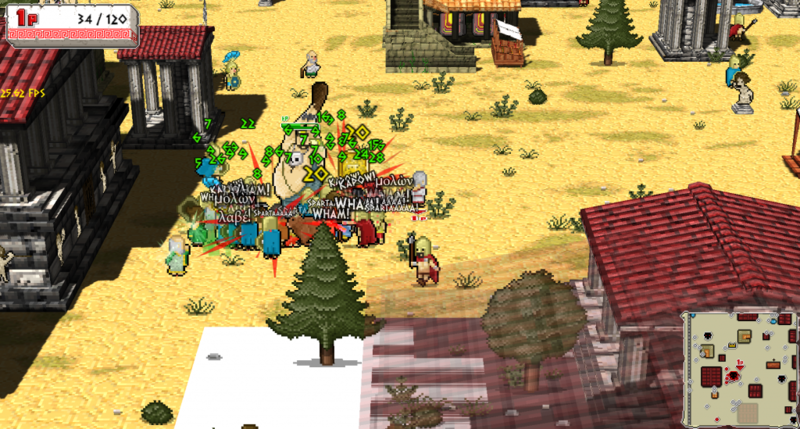 And turn-based strategy angry mob game? As part from that concept exploration, we came with two main genres. One of the things we want to do with the mob, its to make a visceral action game. We want to transmit some kind of funny violence using the whole mob. We thought of the Beat’ em up genre, because it was a good conductor to let the violence loose. The main problem with this was that the whole gameplay started feeting repetitive after a while, and we were losing a key element that was constantly adding people. Also, some playtesters felt that they were very restricted. The game takes place in a corridor so the map exploration element was lost. The other idea was to make a stealth game. The concept was much more elegant than the previous one, the user is constantly adding people to the mob, and avoiding cyclops patrolling different areas. The objective was to add a certain number of people to the mob. Adding more people incremented the difficulty of controlling the whole mob. We had two main problem with this approach. First, it wasn’t very original (none of the two were), since we are using a formula. And second and most important, was that we had lost the “create diverse mob” factor. We started the game with the concept in mind that every mob should be different, according to how you are playing and the choices you are constantly making. Making a stealth game didn’t fit very well with this part. So, finally, we decided to let go of genres, and go back to a simpler concept. Little procedural cities infested with enemies, units sprawling all along the map. We felt that it was fun. And it felt good. Also, the playtesters liked it more. We realized that he have fallen into the good old pitfall of losing objectivity about out game mechanics.Having tested the game for so long, playing the same levels over and over again, had in some way ruined our own discernement of fun from the game. The game will be much more open now, no genre based. And each stage will have different challenges. We have a lot of design choices to make yet, but we feel that we are in a much better state than before making these experiments, that gave us some experience in the fields we aproached. Also, we have no idea where the game is going, hence so much potential!